For the Sedona Arts Center 36th Annual Juried Members Show, March 4-28, 2016, I entered two paintings; both got selected. One of them was an odd painting that came out of me after I had moved to Arizona, yet didn’t feel settled yet. I had been looking at a pink and yellow canvas for quite awhile. The rectangular pink form on the lower half had begun to take on a life of its own. 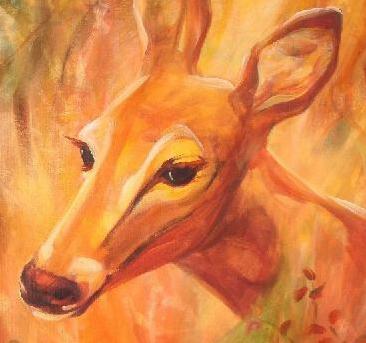 That’s when my friend Scott, forever passionate about deer, commissioned me to paint a deer portrait. The title, “Creating Through Desire and Allowing,” was a subject on my mind. How do you manifest something in your life? 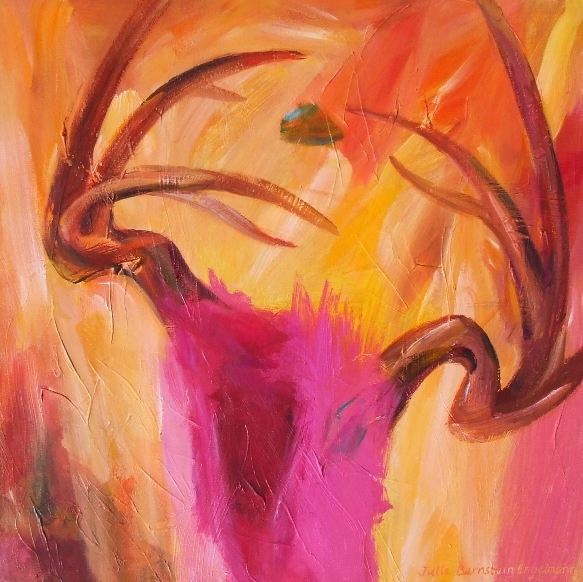 The object coming into view between the antlers represents to me the oscillation between desire and allowing that occurs in the process of bringing a creation into being, into reality. This entry was posted in Commissions, Exhibits, In the studio, Muse on April 10, 2016 by Julie.